Everything goes better with bacon, so the saying goes! And that goes for a mild flavored white fish like halibut, which often needs a little something extra for best taste. 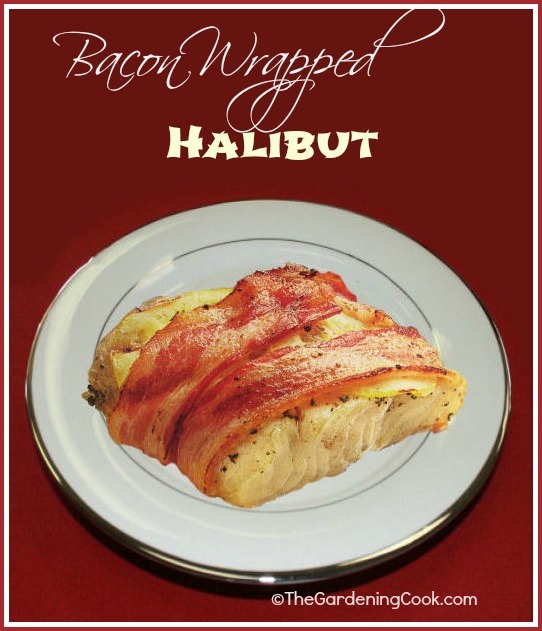 This recipe for bacon wrapped halibut fillets combines a nice mix of fresh spices with lemon and halibut. The parcels are then wrapped in bacon and cooked on the barbeque grill or under the broiler in your oven. This recipes is for a main course but you could even cut the bacon in half and then make the halibut pieces smaller and wrap and secure with a toothpick and serve as an appetizer at your next drink’s party. Serve with rice and a tossed salad for an easy and delicious week night meal. Wrap halibut fillets with bacon and season with fresh herbs and lemon for an easy weeknight meal. Combine the olive oil, spices, and seasonings, with the lemon zest in a large bowl. Mix well. Put the fish in the marinade and flip to coat it well. Put a lemon slice on each piece of fish and wrap with 2 slices of the bacon. Secure with a toothpick. Do the same for each piece of the halibut. Cook for about 5 minutes each side until the fish is opaque in the center and the bacon is browned. Can also be cooked on an outside grill for about 10 minutes.